R can create graphics in a separate window which, by default, appears on the same computer on which R is running. If you are running PROC IML and R locally on your desktop or laptop computer, you can display R graphics. However, if you are running client software that connects with a remote SAS server that is running PROC IML and R, then R graphics might be disabled. If you run PROC IML through a SAS Display Manager Session (DMS), you can create R graphics from your PROC IML program. 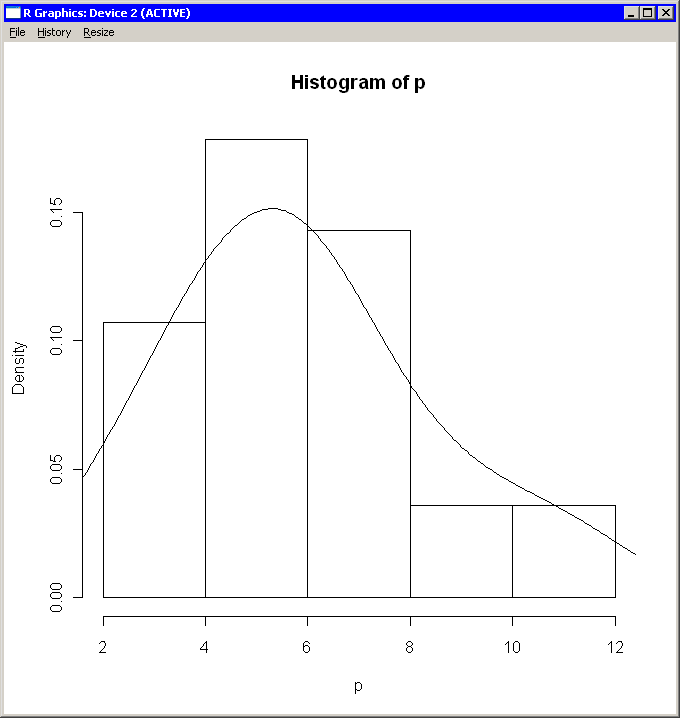 The graph appears in the standard R graphics window. If you run PROC IML through SAS Enterprise Guide, the display of R graphics is disabled because, in general, the SAS server (and therefore R) is running on a different computer than the SAS Enterprise Guide application. If you run PROC IML from interactive line mode or from batch mode, then R graphics are disabled. You can determine whether R graphics are enabled by calling the interactive function in the R language. The hist function creates a histogram of the data in the p matrix, and the lines function adds the kernel density estimate contained in the est matrix. The R graphics window contains the histogram, which is shown in Figure 11.7.